When the Scots emigrated from Ireland, they brought with them a rich blending of belief and tradition based on Celtic myths and legends and Celtic Christianity. Isolated in the islands and highlands, uniquely powerful and superstitious Scottish legends and myths developed in which tradition and a very strong belief in the "second sight" and the faery world predominated. This worldview persisted well into the 20th century (and, we're sure, continues its influence to this day). The result was a culture circumscribed by ritual - each and every day had its ritual elements (how to stir the pot, how to lead the cows, how to celebrate the feasts and saints' days), designed to ensure good luck and blessings and to avoid tragedy. One of the most common elements of Scottish precognition is seeing the dead before they die (ie, knowing who is going to die soon). This ability is not considered a sought-after gift, but one to be dreaded. Scotland abounds in stories and legends of magical seafolk (selkies and mermaids), changeling legends about fairies stealing or possessing the bodies of babies, and tales of shape-shifting witches, ghosts, and family curses, not to mention their famous lake monster. It's hard to know what to make of all this. Some consider the Scots (or Celts in general) to be ethnically predisposed to ESP, while some speculate that certain geographical areas, including Scotland, are more supportive of "etheric" beings (the fairy folk). Though a skeptic, in researching this topic, it was impossible to dismiss all the Scottish legends as unfounded. It is also interesting that certain elements of witch craft and the workings of the "Otherworld" are common the world over - for instance, the Scots, as everyone, used silver to kill shape-shifters (werewolves) and garlic to ward off evil. Whatever your personal beliefs, the folklore of Scotland is fascinating and worth investigating. Visit our History of Halloween page to learn about the celtic origins of Halloween. There is a fine line between stories of the Fair Folk and Celtic myth and religion, so you might want to visit Celtic Mythology as well. We also have a page on Scottish Customs and Traditions. A survey of Scotland's mythical creatures, including kelpies, mermaids, vampires, more. Beautifully told stories of the seal people, the selkies, from fishing villages throughout the coasts of Ireland, Scotland, and the Hebrides. 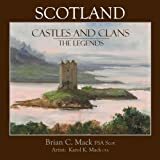 Gorgeously illustrated stories of the Scottish warrior legends, castles and battles, legendary stories from Scottland's clans. Delightful book on the herb lore and potions of Scotland, historically interesting and useful as well. A scholarly work that is one of the best resources out there on Scottish Folklore, fascinating information on the second sight and other Scottish beliefs. Comprehensive collection of Scotland's myths and legends, with interesting background on their history and evolution.